Offers a complete selection of covers and accessories for your car, hot rod, truck, motorcycle, and SUV. The Original California Car Duster® literally works like magic. It utilizes the proven technology of baking a special paraffin wax into 100% cotton strands to assure that dust is lifted and removed, not just pushed around. The Original California Car Duster® gives cars the appearance of looking just washed. The "Dirtier" It Gets.. The better It works. 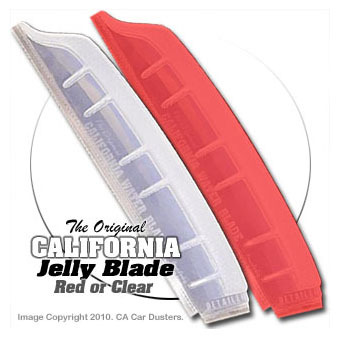 We’ve engineered and designed a new and improved version of The Original California Jelly Blade® and added many key features and benefits. The “Extender” end allows the Jelly Blade to reach into tight areas, and the “Detailer” end is great for recessed surfaces like side-view mirrors. It’s clearly the world’s most efficient car drying tool and is proudly made in the USA! Copyright © 2019 Hart International. All Rights Reserved.